The gangers are back, and this time… they’ve called a Doctor! The latest episode of Doctor Who, the excellent conclusion of a two-parter that began two weeks ago, gave us a delightful double-dose of the Doctor (alliteration anyone?) as the shape-shifting Flesh made a copy of the Eleventh Doctor himself. And a fine copy it was! After enduring some “dealing with previous regenerations” jitters at the start of the episode, the ‘doppelganger Doctor’ was on his game and indistinguishable from the ‘real thing’. Which, of course, caused much consternation for Ms. Amy Pond. Which turned out to be more than a little ironic… but more on that later! As always, if you haven’t seen this new episode of Doctor Who then there are indeed spoilers below! Jellybabies! The episode began with a great nod to the past as the ganger of the Eleventh Doctor relived some of his previous incarnations. This included a mention of one of the Doctor’s favourite candies (in what sounded like the Fourth Doctor’s voice!). Costuming continues to be an important factor in Doctor Who stories as the two Doctors have only one distinguishable difference between them: Their footwear. You may remember that the original Eleventh Doctor had a little run-in with some acid during the previous episode which ruined his trademark black boots. The Flesh scanned him before this incident so… voilà! Same Doctor, different shoes. …sentences. Now that we think about it, two Doctors playing off each other is enough material for a full episode in itself! Or I suppose we could just watch the film Moon again (a fantastic story with a ‘doppelganger’ theme that is a must-see if you haven’t watched it yet!). As we said in our intro, Amy Pond was not as impressed as we were with the two Doctors hanging about! Amy has had a bond with the Doctor since childhood so it made sense that a second version of the Doctor would feel innately ‘wrong’ to her. 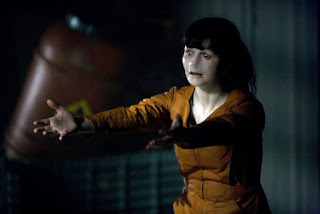 We enjoyed the very intense scene where the Doctor lost control of himself around Amy (we find out later that it was the ‘real’ Doctor), and it included Amy accidentally telling the Doctor about his future “invitation to his death”. The Doctor didn’t seem surprised, however, so that leads us to believe that there’s something odd about that future death. For a while, (who we’re lead to believe is) the ganger Doctor renounces that name and becomes “John Smith” (how many times has he used that name now? It was stunning to see an almost “evil” version of the Doctor, especially when he started pushing poor Rory around! But of course the Doctor always has a plan… including a very tricky “footwear switch” that proved that the Flesh can be just as convincing as the real thing. We’re not so impressed though that the ganger Doctor ended up sacrificing himself to stop the rampaging Jennifer/Flesh monster. Surely there must have been another way to block that door! They did hint, however, that the Flesh may be able to reconstruct. It would be great to see the two Eleventh Doctors again. Finally, the convincing nature of the Flesh is further proved in the shocking twist ending! How ironic was Amy’s prejudice, indeed. We have to admit, that was one of the biggest surprises Doctor Who has pulled on us in a while (the last big twist along the same lines would probably be the Yana/Master surprise in Series 3), so it REALLY ups the ante and leaves us hungry for the next installment!